One NASA astronaut launching to the International Space Station in May is ready to 3D print in space. Astronaut Reid Wiseman, bound for the station in May, is eager to use the first 3D printer in space this summer. Wiseman, flying into space for the first time as a member of the Expedition 40/41 crew, thinks that the implications for 3D printing in space are exciting and far-reaching. While Wiseman thinks that 3D printing is important for the future of human spaceflight, he doesn't necessarily think that allowing station crewmembers access to the printer at all times is a good idea. "I think the ground will uplink a sample and get it to print out because if they let the crew print stuff out, we'd run that thing out of ink in five minutes," Wiseman joked of the 3D printing process. "We'd print out all kinds of good stuff … Just to know that this technology works in microgravity, I think it's going to change our future flying." NASA astronaut G. Reid Wiseman is excited about the long term implications of 3D printers in space. A 3D printer developed by the company Made in Space is slated to launch to the station on SpaceX's fifth robotic resupply mission using the private spaceflight company's Dragon capsule and Falcon 9 rocket. 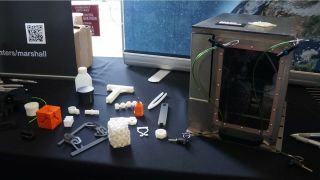 The Made in Space printer, called 3D Print (short for the 3D Printing in Zero G Experiment), uses a process called extrusion additive manufacturing to create various objects. Items are made by layering polymers or other materials on top on one another. The company's 3D printer can manufacture about 30 percent of the spare parts currently on the space station, Made in Space co-founder and chief technologist Jason Dunn said during an event in 2013. "3D printing is an exciting technology," Niki Werkheiser, 3D Print project manager at NASA Marshall's Technology Development and Transfer Office, said in a statement last year. "It will allow us to live and work in space with the same efficiency and productivity that we do on Earth, with the ultimate objective being to eliminate reliance on materials and parts launched from the ground." Recently, NASA also awarded a $125,000 grant to develop a space food making 3D printer that could be used on long-duration manned missions to deep solar system locations like Mars. Officials with Systems and Materials Research Corporation (SMRC) — the company that received the grant — are crafting an advanced prototype that can print pizza for hungry spaceflyers.